Jacksonia scoparia, Dogwood, is a tall shrub reaching a height of 3-4 metres. The trunk is dark grey and furrowed. Branches are pendulous and the leaves are usually reduced to scales although young plants and regrowth after plant damage will produce true leaves. In spring and early summer plants produce masses of yellow pea flowers that are sweetly scented and attract butterflies. Blooms are follows by small pods holding one, hard-coated seed. J. scoparia has proved to be hardy and free flowering. A light prune, after flowering, will encourage dense growth and bounteous blooming. There are 40 species in the genus and are all endemic. Western Australia has the lion’s share of Jacksonias but J. scoparia is the best known species. J. scoparia is found in eastern NSW as well as Queensland. Dogwood was grown, under glass, in England from 1803. J. scoparia is not widely cultivated but would make a blooming splash in a native shrubbery. The genus is named after George Jackson, a Scottish botanist. 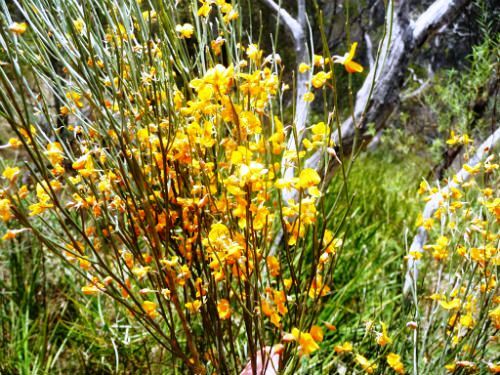 The species name means broom-like. We are uncertain about the origin of the common name. One could say that it refers to its bark. But that is probably going too far. Certainly the species bears no relationship with the exotic Dogwood (Cornus sp.). Propagate from seed that will need soaking in boiling water before sowing.